Episode 2 is here! Mark & Matt bring you more from a galaxy far, far, away as we get you ready for Rogue One: A Star Wars Story. We start off discussing with our episode question as you continue to get to know us and our love for Star Wars. We then discuss a little bit of Star Wars Rebels and the latest on the show that every Star Wars fan should be watching! Then we prepare you for Rogue One. We discuss the characters you will see in the new film and then we talk about preparing for war in the Star Wars universe. What should you bring with you? What kind of clothing, food, and other items might you need to survivie in the roughest parts of the galaxy? 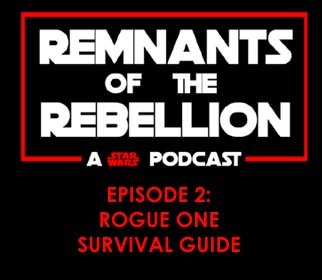 We attempt to help you prepare for the war in Star Wars! Enjoy and thanks for listening!